iPhones these days offer an influx of all different mobile applications. They range from Business to Education to Food and Drink to Games to Medical to Music to Photo and Video to Social Networking to Weather. With such a vast selection how can one choose? My favorite mobile apps are the ones that keep me connected. These include, Twitter, Facebook, Instagram, Pinterest, Stumbleupon, Pandora, and HeyTell. Twitter is definitely my most commonly used app. Twitter is a micro-blogging social network site in which users send “tweets” to their followers. Each tweet has a limit of 140 characters, users can attach photos, videos, links, and use “hashtags” in their tweets. Hashtags are used to categorize popular topics or phrases in tweets, but are mostly used to say funny little things. The Facebook mobile app is very convenient, it allows users to do everything they do on Facebook all through their mobile device. The one problem I am finding with the mobile app version of Facebook is looking at my friend’s pictures; the mobile app version does not allow you to do this. Instagram is a fairly new app, but its popularity is soaring. Instagram is a photo-sharing application, much like Twitter. You have followers and you can follow your friends. Instagram allows you to document your life through photographs. Users can upload and edit photos, and then share them to Facebook, Twitter, and email. Pinterest is another one of my favorite apps: Pinterest is a website and mobile app. Pinterest allows you to create boards, and from there you browse your interests and you literally pin your likes on that board. Pinterest is a great way to organize things and find ideas for party planning, hair and beauty, and fashion tips. Pinterest is now reaching out to men with sections on sports, gaming, and food. Stumbleupon is a website and mobile app dedicated to distraction. When you create your account you are asked to select your interests, from there you hit the “stumble” button and you are taken to sites related to your interests. Pandora is my third favorite app, for all the music lovers out there Pandora is for you. Pandora users can type in any song, album, artist, or genre and Pandora creates a playlist with music related to what you chose. Pandora is a great way to find new music and artists you may not have heard of before. The last app I’m going to talk about is HeyTell; Heytell is a mobile iPhone to iPhone walkie-talkie. HeyTell users add their contacts as “buddies” and from there can send and receive voice messages. HeyTell is great for sharing stories, a laugh, or just silly inside jokes. HeyTell is fun for people on the go who can’t always text. Those are some of my favorite mobile apps; I hope that I suggested some new apps for you! The passing of the visionary and innovator, Steve Jobs, was a great loss for our industry. The Apple brand has not only become the platform of choice for our entire business, but Apple products have made it much easier for our company to communicate with each other and our customers. In 1996, Jobs company, NeXT was purchased by Apple. This returned Jobs to the company he created with Steve Wozniak and Ronald Wayne. Jobs was fired from Apple in 1985. This allowed Jobs to create the wildly successful Pixar and NeXT Computer companies. His return to Apple sparked a rapid evolution in how the world communicates. Apple has been the leader within design circles for nearly two decades. Apple computers are used by all of our marketing and design team members. Our team also embraces the many other devices created from the mind of Steve Jobs. He has revolutionized the phone and other mobile devices. The entire AlphaGraphics team uses the devices everyday at work or in their personal lives. Our marketing team continually monitors technology leaders such as Jobs. We are always looking for what’s next. We enjoy the experimentation and implementation of technologies developed by innovators such as Jobs. The use of leading technologies aids our team in helping our customers communicate with their customers. This has always been our goal at AlphaGraphics. I believe the goal of Jobs was to allow people to make life simpler and more enjoyable in business and in pleasure. AlphaGraphics wants to make the lives simpler for our customers. We are dedicated to this by any means necessary. Embracing the next thing allows us to do this. Jobs was always about what’s next. His creativity and ingenuity will be missed. Navigating the Sea of Communications Technology: Sink or Swim? I’ve been thinking about the mind-blowing way technology has made its way into every crack and crevice, every hour, minute, and second of our lives. Watching my favorite show, Breaking Bad, last Sunday night, I was astounded at how many times during the hour I saw a commercial for a mobile phone or mobile-related product. Do people do dumb things with smartphones? Do we need an app to tell us how we rate on the moron meter, or one to show us how we’d look with ginger hair? Apparently yes, we most certainly do. Yes, I need my laptop, smart phone, itouch, wireless router, modem, Bluetooth-Satellite-Radio-OnStar-enabled car, Facebook, LinkedIn, and Twitter. They help me make a better living, travel more safely, and connect in miraculous new ways with friends, relatives, and colleagues. But are they the center of my universe, the be-all and end-all of how I communicate? Call me old school, but I also like things that don’t require technology and thumbs. Like walking my dog (she communicates with me nicely without any thumbs). And talking with people who are actually in the same room with me, when they’re not using technology to talk with someone else while I’m talking to them. These people—the technology natives whose appendages include two arms, two legs, and a cell phone each—are my kids. While I’m infinitely thankful that I can call or text them to find out how they’re doing at any moment, instantly share a photo I’ve just snapped on a business trip, or reach them quickly in an emergency, nothing replaces the warmth of their smiles and the comfort of their hugs. I want them to know that while I value technologically enhanced communication, nothing comes close to the intonations of a voice, the firmness of a handshake, and the power of looking someone straight in the eyes. I want them to realize that technology shouldn’t replace other (more intimate) forms of communication. Rather, it should complement and enhance them. And that the choice as to whether they allow the increasingly overwhelming technologies to create emotional distance and separation, or they work hard at building meaningful relationships while using technology to add depth and breadth, is theirs. As with exercise, diet, spirituality, giving, and any other body- or character-building endeavor, successful communication takes commitment, time, and effort, and discipline. Knowing how to choose appropriately the best form, or combination of forms, of communication for the situation is key. It’s my job as a parent to teach my kids how, when, and why to make those appropriate choices. Which is why I embrace communications technology and look to glean from it those things that add richness to life. And I pounce on “teachable moments” with my kids in which I can instill a balanced, high-tech/high-touch philosophy of communication. Early this week, Rich Cichoski & I traveled to Chicago to attend this year’s 2011 Graph Expo held at the McCormick Center. Not only did we have a great time eating deep dish pizza, but we also found the show to be invaluable. 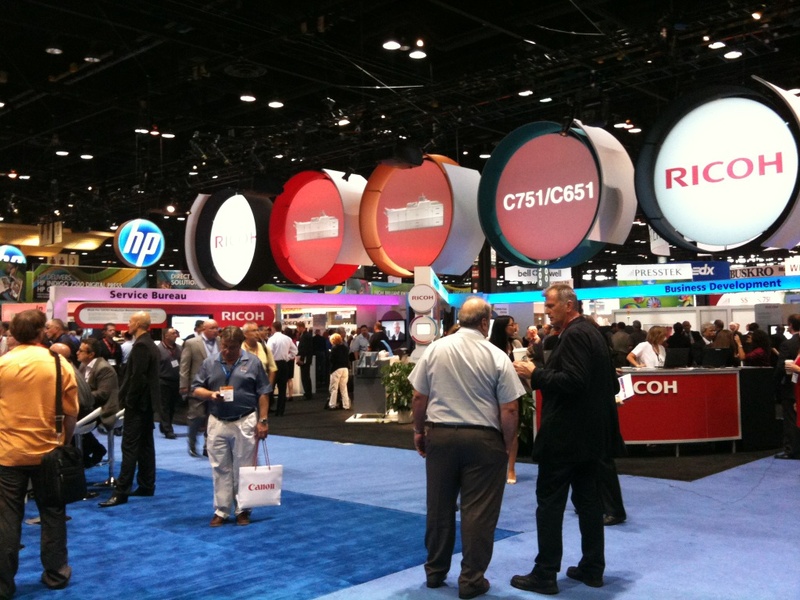 Graph Expo is an annual trade event for the graphic communications industry. The show features leading manufacturers and suppliers exhibiting newly released products, technologies and services in marketing, communications, and printing. The show was full of live demonstrations using real software and equipment. While we did see look into a piece of finishing equipment that we would like to purchase in the next few months, the majority of our time spent at the show was spent seeking out experts in our industry to help us educate and provide insight about new training opportunities for our staff. For example, through the MFSA (Mailing & Fulfillment Service Association), we identified a mailing specialist that we are hoping to bring to Pittsburgh to educate and certify our staff as Quality Mail Preparation Specialists. The list is long, but we brought home a bunch of great information that we are excited to pass along to the experts in our staff to continue to improve and provide better and new services to our customers. For many years, the company newsletter has been a staple of corporate communication. But with rising production costs and electronic media overwhelming us by the nanosecond, the efficiency and effectiveness of the newsletter has come into question. Marketers are being held accountable for results, and to put it mildly, it’s simply difficult to track a newsletter’s ROI. Let’s face it – electronic marketing materials often overwhelm us even when we subscribe to them. Between daily emails, RSS feeds, e-newsletters, coupons, correspondence, press releases, invitations, e-cards, and similar materials littering our inbox and smart-phones, we have precious little time to sift through the clutter. Savvy marketers and business owners need to continually find ways to avoid the customers’ DELETE button. There are a number of ways to do this, and publishing a newsletter in a number of different formats is one solution. However, HTML newsletters and text-only emails don’t provide a ‘wow’ factor, and many PDF newsletters are too large (greater than 5MB) to be received via email. So what’s a busy owner or marketer to do? If you’ve ever seen the Harry Potter movies, you may remember the Daily Prophet – a sort of talking newspaper with moving images. While we can’t get video on paper just yet, we now have the ability to create online flash publications that can be custom-created and housed on a web site. These often overlooked online marketing tools give the ability to create, distribute, and host sophisticated electronic publications that go well beyond the standard company e-newsletter. New software allows us to add enriched features including navigation, video, on-page flash animation, hyperlinks, audio, interactive forms, social media sharing and more, complete with the popular “flipping pages’ effect that give the newsletter a printed feel. In addition to potentially aiding in search engine optimization (SEO), perhaps the most important elements of this new medium are the ability to measure, track, and analyze readership data. Your interactive online publication not only gives you the ability to connect with your customers, but to find out where their interests lie by examining analytical data via online dashboards. This can be a great advantage as you decide what type of content you will add in each issue. Consistently creating and distributing a newsletter can be a daunting task, but interactive online publications can help make it a little bit easier. Like the other items in your marketing arsenal, your company newsletter can be a highly targeted, sophisticated weapon that will increase brand awareness in the mind of your prospects and customers, and ultimately add to your bottom line. Technology in the Marketing and Advertising world is one of the most exciting and ever-changing landscapes in business today. New terms are coined almost daily and in a recent article by DigiDaily, Advergaming is set to become a big movement in promotions. Most recently, 20th Century Fox has partnered with Rovio games to brand its' ever-popular game, Angry Birds, with characters from the animated feature Rio. With both free and paid versions available for download, and Rovio announcing it hit a new company record with over 10 million downloads in 10 days, the sky is the limit. Hand held devices are getting much attention today as companies are focusing on ways to drive major impact in the palm of the consumers hand. We have branded stadiums, branded police cards, and now Angry Birds Rio. Such great response begs to ask the question, what's next?